The conceptual framework for the initial and advanced programs establishes the shared mission for the unit’s efforts in preparing “educators who are builders of knowledge, values, and community” for service in P-12 schools. It is the basis upon which programs, courses, teaching, candidate performance, scholarship, service, and unit accountability are established and sustained. The conceptual framework is knowledge-based, articulated, shared, coherent, and consistent with the institutional and unit mission statements. creates a safe, supportive learning community within the classroom. The concepts of social constructivism support this metaphor and its associated principles. At the core of constructivist theory is the idea that learners must individually discover and transform complex information if they are to make it their own (Ryan & Cooper, 2004). Learners engaged in a constructivist classroom constantly check new information against previous rules and revise them when they no longer work. (Slavin, 2006). Pass (2004) notes that the social construction of meaning occurs through a communications dialogue. Each participant within the community is continuously revising and reforming meaning as a collaborative process. Several of Vygotsky’s concepts that are central to his theories and complementary of the social constructionist position likewise provide a theoretical foundation for the Teacher Education Program. Four key principles derived from Vygotsky are critical to the teacher as builder, including the social nature of learning, the zone of proximal development, cognitive apprenticeship, and mediated learning (Slavin, 2006). Most significantly, Vygotsky places social interaction at the forefront of his theories. Intellectual development occurs, therefore, through the engagement in activity in the company of parents, teachers, peers, and others. Thus, the teacher must be a competent builder of knowledge. Along with Vygotsky, Piaget and Kohlberg’s concept of moral development espouses a constructivism approach to learning. Piaget observed that children often engage in discussions of hypothetical situations, which lead to a morality of cooperation as the child’s social world expands to include interaction with increasing numbers of peers. Kohlberg also recognizes that the development of moral reasoning and insights are greatly influenced by the relationships and individual responses to structured situations. Effective teachers and teacher education programs thus promote the development of teachers with critical thinking and problem solving skills. They also encourage the inclusion of opportunities for these social interactions and incorporate values education at the global, local, and individual levels (Lickona, 1991). Accordingly, teachers must become caring builders of values. Moreover, such teachers must engage in self-examination and reflection of their own performance and use their conclusions to improve their teaching. The emphasis on the social nature of learning and the use of groups of peers to model effective ways of thinking, as well as identify and challenge misconceptions, are key elements of Piaget’s and Vygotsky’s conception of cognitive change (Slavin, 2006). Vygotsky, furthermore, applies his principle of learning as a social construct to his concept of the zone of proximal development, which is a shared creation of the learner and the more competent “others” (Ryan & Cooper, 2004). According to Vygotsky (1978), the zone of proximal development is “the distance between a child’s actual development level, as determined by independent problem-solving, and the higher level of potential development, as determined through problem solving under adult guidance, or in collaboration with more capable peers” (p. 86). He also states that a constructivist approach makes extensive use of cooperative learning because students will discover and comprehend difficult concepts if they can discuss problems and issues with peers. Thus, the teacher must be a committed builder of community. Learning occurs through a building process. To teach another, one must have more advanced knowledge than the learner. Such a teacher must have the necessary skills needed to transform this knowledge into meaningful experiences where students can acquire this new knowledge. The tenets of social constructivism, as well as the specific principles posited by Vygotsky and his peers, supply the theoretical foundation for the Conceptual Framework which guides the Teacher Education Program of the College of Education. The guiding metaphor of the Conceptual Framework centers on the concept of the “Teacher as Builder.” This concept is made concrete through the multiple roles assumed by the teacher within the classroom, the school, and the community. The teacher serves as mediator in the learning process. Through the teacher’s actions as a builder of knowledge, values and community, learners are engaged in meaningful learning experiences that facilitate the acquisition of information that then becomes the foundation for the development of critical thinking skills. Pass, Susan. (2004). Parallel paths to constructivism: Jean Piaget and Lev Vygotsky. Greenwich, CN: Information Age Publications. Ryan, K. & Cooper, J. (2004). Those who can, teach. Boston, MA: Houghton Mifflin Company. Vygtosky, L.D. (1978). Mind in society M. Cole, V. John-Steiner, S. Scribner, & E. Souberman, (Eds.). Cambridge, MA: Harvard University Press. The College of Education is accredited by the National Council for Accreditation of Teacher Education (NCATE), and the South Carolina State Department of Education. The College of Education offers a comprehensive and systematic sequence of courses designed to develop the knowledge, skills, and dispositions necessary for effective teaching. Programs are available that lead to a Bachelor’s degree with initial certification from the State of South Carolina in Early Childhood Education; Elementary Education; Elementary Education with add-on certification in Early Childhood Education; Elementary Education with add-on certification in Special Education Learning Disabilities; and Special Education: Multi-categorical. In collaboration with Departments of the College of Arts and Sciences, the College of Education also offers the option of completing a prescribed sequence of Professional Education courses that lead to initial teacher certification in the secondary (9-12) areas of English, mathematics, and social studies. Undergraduate degrees with initial teacher certification are also offered in Art Education (K-12) and vocal or instrumental music education (K-12) in partnership with the The South Carolina School of the Arts. The College of Education is commonly referred to as the “unit.” In collaboration with College of Education colleagues, university colleagues, stakeholders, and teacher candidates, the College of Education developed a unit assessment system that monitors the competency of all teacher candidates throughout the program. 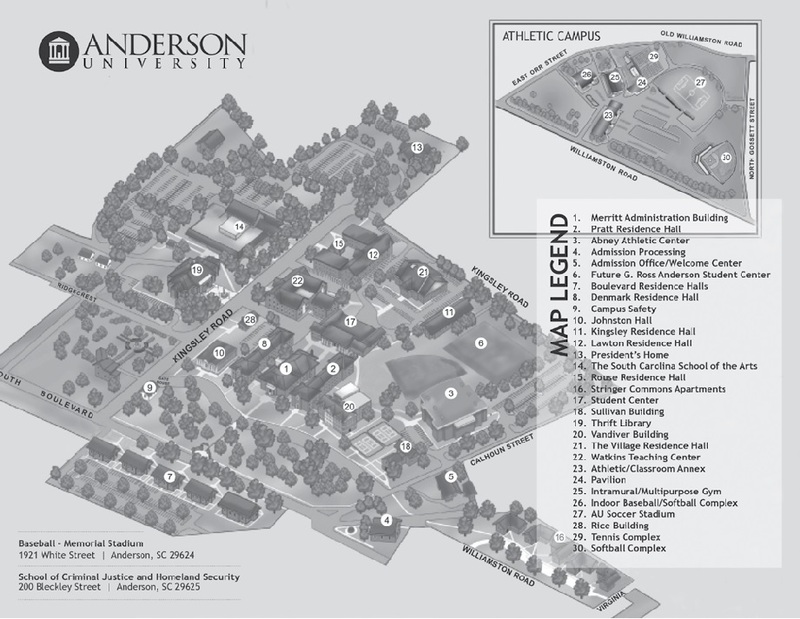 The unit assessment system also serves to ensure the quality of the teacher education program at Anderson University and the teaching profession. The three levels of the unit assessment system are referred to as “Benchmarks.” The successful admission to each Benchmark is based on the teacher candidate meeting specified requirements. A teacher candidate may not continue in the education major by scheduling additional education courses, other than those permitted prior to Benchmark I, if all criteria of a specific assessment level are not met. If any requirement of an assessment level is not successfully met, the teacher candidate will be required to remediate all deficiencies as set forth in a Candidate Assistance Plan (CAP). The following information describes the requirements for each Benchmark that comprise the unit assessment system. achieve a minimum cumulative grade point average (GPA) of 2.75.
achieve passing scores on specified SC 4.0 Performance Standards/InTASC Standards based on a Teaching Audition adjudicated by professional educators. a fingerprint review as mandated by South Carolina state law. An applicant must have a full set of legible fingerprints through www.identogo.com. The fingerprint review is conducted by the State Law Enforcement Division (SLED) to determine any state criminal history and the Federal Bureau of Investigation to determine any other criminal history. There is a fee required for both the application and background check payable during the application process. sign a statement indicating adherence to a Code of Professional Ethics. have a minimum cumulative grade point average (GPA) of 2.75.
submit the e-portfolio, which will be assessed by a professional educator who has served in the community. The portfolio will present evidence that the teacher candidate has met competency in all InTASC/AU Standards. The teacher candidate must obtain a minimum rating of 3.0 “Meets Expectations” on each element of the electronic portfolio. they must earn an A or a B. The minimum observation score is 1.90 in EDU 490 - Clinical Experience . The teacher candidate must receive a final overall rating of 3.0 “Meets Expectations” on all of the ADEPT Performance Standards by the Clinical Surpervisor and the Cooperating Teacher upon the completion of the Clinical Experience placement(s) (InTASC Standards 1-10). A teacher candidate is considered a “program completer” when all the requirements for teacher certification as prescribed by the College of Education have been completed. A preteacher candidate will not be accepted into the Teacher Education Program if that person has committed a felony. Prior to admission to the Teacher Education Program, the student enrolled in the prescribed 16 hours of education courses is referred to as the “pre-teacher candidate.” Once the pre-teacher candidate has successfully passed Benchmark I, that designation is revised to “teacher candidate.” However, the candidate must be admitted into the Teacher Education Program before enrolling in additional courses with an EDU, EDC, or EDS prefix. The criteria for each Benchmark must be successfully completed or the candidate will be issued a Candidate Assistance Plan (CAP) that specifies a period of time in which a remediation plan that addresses areas of deficiency must be completed. It is strongly suggested that the pre-teacher candidate pass The Praxis Core Academic Skills for Educators (Praxis Core) as soon as possible. Additional information regarding the Praxis exam may be found at www.ets.org. A pre-teacher candidate who enters the education major with an old score of 1650 on the math, verbal, and writing sections or a new SAT score of 1100 on Evidence-based reading and writing and math or an ACT composite score of 22 may waive the Praxis Core requirement. A teacher candidate may exempt part of the Praxis Core. Check with the College of Education for more details. The South Carolina Department of Education mandates that the teacher candidate complete a minimum of 100 hours of field experience in public school settings prior to the Clinical Experience. Accordingly, three field-related courses are part of a continuous and hierarchical model that prepares the teacher candidate for the Clinical Experience. These courses are designed to give the teacher candidate ever-increasing time, observation, and experience in the classroom. The College of Education has cooperating agreements with the school districts of Abbeville, Anderson I-V, Greenville, Greenwood 50, Greenwood 51, Oconee, Pickens, and Hart County, GA that facilitate the completion of these course requirements. Placements in cooperating public schools are based on various factors, such as the quality of the school’s education program; the proximity of the school to the University; the disposition of the school administration regarding the accommodation of field experience students; and the diversity of the student population. It is the strong belief among the faculty members of the College of Education that the teacher candidate’s preparation for the education profession includes field experiences in classrooms that reflect a diverse student population. These classrooms include students who are characterized by differences in race, ethnicity, socioeconomic status, and abilities. Therefore, the teacher candidate is assigned to varying cooperating schools and grade levels that include a demographic makeup that approximates that of the diverse communities comprising the local school district. Specifically, the teacher candidate is assigned to a minimum of three different grade levels in three different public schools in fulfillment of the requirements of the field experience courses. Students are responsible for their own transportation to and from these field experiences and Anderson University assumes no responsibility or liability for accidents or injuries that may occur. The teacher candidate may not fulfill the requirements for any field experience in a public school at which a relative is employed. The capstone course for the education major is EDU 490, Clinical Experience, which occurs during the teacher candidate’s last semester. In order for the teacher candidate to participate in the Clinical Experience, all course work must be completed. The South Carolina State Department of Education requires that the teacher candidate complete a minimum of 60 days of Clinical Experience in a cooperating public school. The College of Education requires the teacher candidate to complete a minimum of 65 days of Clinical Experience in cooperating public school as a requirement of Benchmark III. The Clinical Experience must be considered the highest priority among the teacher candidate’s other activities. The fact that the course schedule of the teacher candidate has been arranged so that all academic requirements are fulfilled prior to the Clinical Experience attests to the importance it is assigned by the College of Education faculty. Because of the great demands inherent during the Clinical Experience, maintaining employment during the Clinical Experience semester is strongly discouraged. The teacher candidate may not participate in extra academic and non-academic activities that have the potential to adversely affect the teacher candidate’s performance in the cooperating public school. The teacher candidate who achieved a grade of “C” or below for the Clinical Experience, as defined in Benchmark III, must repeat the Clinical Experience semester to be recommended by the College of Education for initial certification by the South Carolina State Department of Education. The teacher candidate in this situation may repeat the Clinical Experience once upon approval by the faculty of the College of Education. A decision to permit a repeat of the course will be made only if there is a consensus among the faculty who have taught the student in professional education courses that the area(s) of deficiency can be improved to the extent that the teacher candidate possesses the knowledge, skills and dispositions to successfully complete the Clinical Experience. • Secondary English Education (9-12), B.A. • Secondary Social Studies Education (9-12), B.A. • Elementary Education with add-on certification in Early Childhood Education, B.S. • Elementary Education with add-on certification in Special Education Learning Disabilities (K-12), B.S. • Secondary Math Education (9-12), B.S. • Special Education: Multi-categorical, B.S. • Elementary Education - Adult Studies, B.S. • Elementary Education with add-on certification in Early Childhood Education - Adult Studies, B.S.